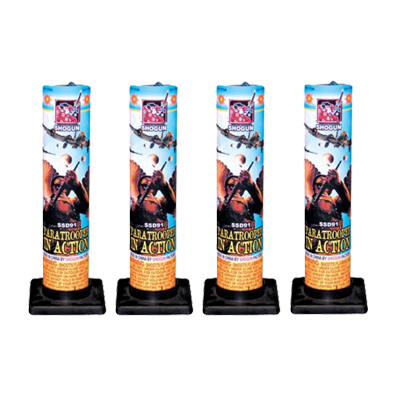 Paratrooper in Action Box – 4 Pack. Plastic toy soldiers hang on 10″ parachutes, with crackling stars to draw your attention. Drop Zone - 109" Parachute with army man attached. Paratrooper in Action Singles - A plastic toy soldier hangs on a 10" parachute, with crackling stars to draw your attention. Screaming Eagles - A jumbo red, white and blue parachute that drifts to the ground as it crackles or smokes with a moveable army man attached. The kids will love this hot item! Double Parachute Night - Shoots 2 parachutes into the sky. When open, color flares float back down. 7" Parachute w/ Flare - Shoots a single parachute up into the sky. This is a nighttime item and has color. Double Parachute Day - Shoots 2 parachutes into the sky. This daytime item has no color or nighttime effect. Night Type Single Parachutes - Shoots a parachute into the sky. When open, a color flare floats back down. 40" Mammoth Parachute - 40" daytime parachute that can be seen from a long distance. Kids will love chasing it! !